Kobus has been with Equi-Feeds since 1998. He was involved in the procurement of raw materials around South Africa for the first 4 years, and since then has been involved with shows and developing sales in the Southern Cape, Free State, Northern Cape and Namibia. He is a certified Senior Ring Steward in the Saddler and Sport Horse Industry and is well known throughout South Africa with sport horse and endurance people. For any queries and/or advice please contact Kobus on 083 409 7064 or email him and he will be happy to arrange a consultation with you. Di is a qualified farrier having completed a Farrier course at the “Michigan School of Horse Shoeing” with owner Red Tomlinson in the USA. During the course she worked on horse farms in Michigan shoeing horses. On her return to SA she lived and worked in Robertson teaching riding and working on Stud farms. She subsequently moved to Natal and was employed as a sales consultant for a national manufacturer of consumer products. Di continued to be involved with horses and rode competitively as a Show Jumper. Although no longer competing, Di still rides and owns her own horse. 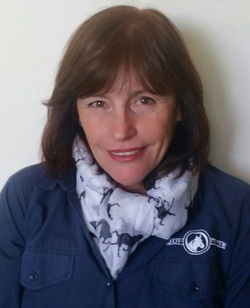 In 2014 she joined the Equi-Feeds team as the Sales and Marketing Consultant for the Western Cape. For any queries and or/advice please contact Di on 082 867 8000 or email her and she will be happy to arrange a consultation with you.